Beeroffer.co.uk has all beer offer from supermarkets in the United Kingdom. A beer offer is a discount on beer. Every week we search for beer offers in supermarkets, so you can find the most actual beer offers right here. Each offer will be shown at one of our pages: discounts on packs of beer, discounts on bottles of beer, discounts on cans of beer. There are offers of big supermarkets like Tesco, Asda and Sainsbury's. A lot of folders of supermarkets have different beer offers. If we find an offer, you will see it back at beeroffer.co.uk. We also display offers of smaller supermarkets. If a store has a beer offer, you will definitely find it at our website! As you can see in the example: each beer offer displays the brand and a picture of the package, with information about the offer. With one glance you can see retailprice and the sale price, the supermarket where the beer is on offer and the date until which the offer is valid. This display makes it easy for you to compare prices of beer at different supermarkets. Beeroffer.co.uk searches for different styles of beer. A lot of big beer brands like Budweiser have an alcoholrate around 5%. Next to normal beer there are also special beers with a discount. You can find every beer, so also your favorite ones at beeroffer.co.uk! You can save a lot of money with the different beer offers that you can find at our website. We don't want people to miss out on beer offers, that's why we will update the website daily. Forget folders of supermarkets! Just visit beeroffer.co.uk when you have a cravinf for beer and save a lot of money! Hosting a party? Then you need to have enough beer. Get your packs of beer with great discounts! 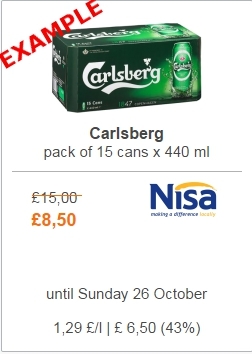 Beeroffer.co.uk has the most current offers. You don't have to spend too much money. How much beer do I need for a party? One person drinks an average of 2 bottles of 0,3 liter an hour. Bigger drinkers will drink an average of 3 bottles of 0,3 liter an hour. Dependending on what time the pary is and the amount of visitors on your party, you can calculate how many drinks you need for the party. Buying an extra pack of beer isn't a problem, right?